From the agricultural commodity markets to the Presidential debates, exports have been top-of-mind for many in 2016. Specifically within agriculture, a stronger U.S. dollar combined with building inventories of corn, wheat, and soybean in the U.S. has put significant attention on exports. For this week’s post we take a step-back and look at the high-level tends in U.S. ag exports. In figure 1, the real (or inflation-adjusted) value of U.S. agricultural exports are shown from 1967 to 2015 (2009 = 100). Total ag exports (in blue) surged from $40 billion dollars in 1971 to $115 billion in 1980. Total ag exports then crashed during the 1980s. From the peak in 1980, total exports collapsed to $60 billion by 1986, a 48% contraction. Ag exports played a critical – and often overlooked – role during the 1970/1980s farm boom and financial crisis. After the 1980s, total ag exports recovered and leveled-off around $80 billion dollars annually through 2005. In 2005, ag exports began to surge and by 2014 would peak at $155 billion. Total ag exports nearly doubled in just 9 years. 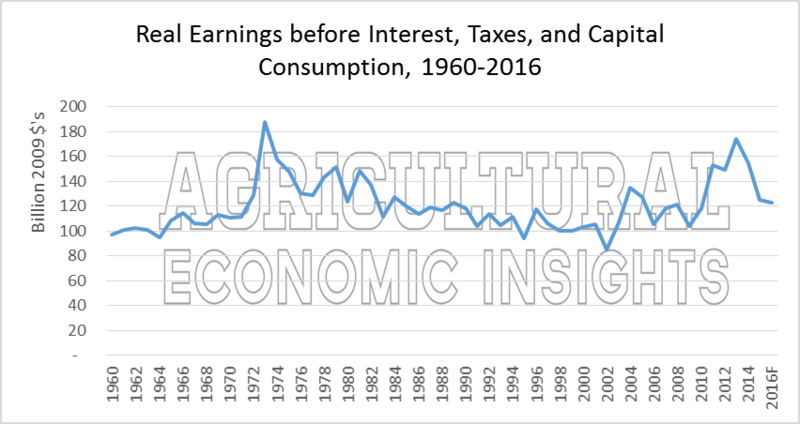 Similar to agricultural boom-era in the 1970s, growth in ag exports were an important – and often overlooked- element of the most recent boom in production agriculture. Also shown in figure 1 is a sub-category of total ag exports, bulk ag exports (in orange). Bulk ag exports are those most of us commonly think of as it includes the commodity exports (such as corn, wheat, and soybeans). It’s important to note as the real (inflation-adjusted) value of total ag exports recently surpassed highs set in the 1970/1980s, bulk ag exports have not done so (peaking at $54 billion in 2011 compared to $72 billion in 1980). More on that in a bit. What’s causing the recent decline in ag exports? A couple of thoughts. First, the overall value of agricultural exports, especially bulk commodities, has declined as commodity prices have decreased. Second, strengthening of the U.S. dollar since 2014 has made U.S. ag products –relative to other countries- more expensive. Figure 1. Values of Total U.S. Ag Exports (blue) and Bulk Ag Exports (orange), Billions of Dollars (2009=100). 1967-2015. Data Source: USDA’s FAS: GAT (Global Ag Trade) Database. As previously alluded to, the composition of ag exports has changed over time. In figure 2 the share of total ag exports that are consumer oriented (blue) and bulk (orange) products are shown. Accounting for more than 60% of the total value of all ag exports, bulk products accounted for a majority of ag exports in the 1960s and 1970s. Since the 1980s bulk exports have accounted for a smaller share and currently represents less than 30% of total ag exports. On the other hand, consumer oriented products (in blue) have increased from 10-15% of total ag exports in the 1960s to more than 40% in 2015. Although not show, the value of exports in both categories (consumer oriented and bulk) are lower in recent years. Bulk ag exports in 2015 were 18% lower than 2014 levels. This is a significant drop compared to the 8% decline in ag exports of consumer oriented products. Furthermore, consumer oriented exports peaked in 2014 while bulk exports peaked in 2011. Overall, bulk exports have declined 26% in value over the past 5 years. Figure 2. Share of Total Ag Exports that are Consumer Oriented (blue) and Bulk (orange) products. 1967-2015. Data Source: USDA’s FAS: GAT (Global Ag Trade) Database. 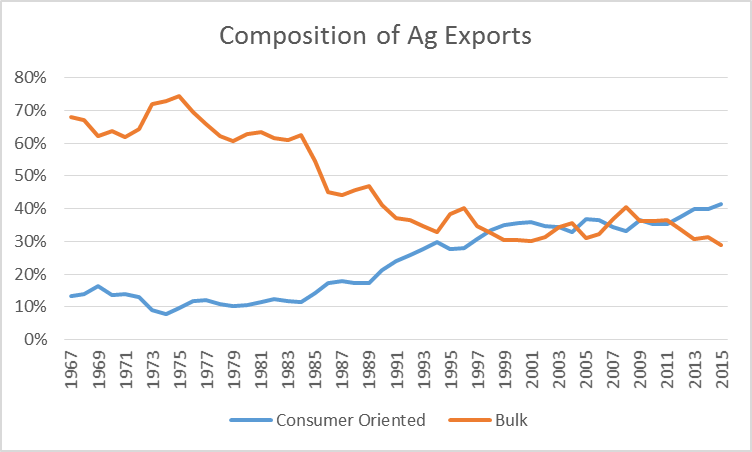 As earlier mentioned, ag exports, especially bulk exports, were an important feature of the previous ag boom during the 1970s. In an attempt to quantify the role exports played, figure 3 shows the value of bulk ag exports relative to the value of farm-level ag production since 1967. During the 1970s, the value of U.S. bulk ag exports was commonly equal to 40% (or more) of the value of farm-level ag production. This was much higher than the 20% level common in the 1990s and nearly 25% level reached in recent years. Even though bulk exports, measured as a share of the value of farm-level production, increased in recent years, they did not reach level observed in the 1970s. In our opinions, this is one of the important difference between the recent agricultural boom and the boom/bust of the 1970/1980s. Figure 3. Bulk Ag Exports as a Share of Value of Ag Production, 1967 – 2015. Data Sources: USDA ERS and USDA’s FAS: GAT (Global Ag Trade) Database. It’s also important to also consider where U.S. ag exports are sold. In 2015, the three largest purchasers of U.S. ag exports were Canada (16%), China (15%), and Mexico (13%). Collectively, these three counties accounted for 44% of all US ag exports. In figure 4, the share of total ag exports these three counties accounted for is shown over time. Since 1990, all three counties have accounted for a larger share. As a whole, these three countries accounted for a total of 19% of all exports in 1990. To put this a bit differently, Canada, China, and Mexico collectively doubled the share of total ag exports they accounted for in just 25 years (19% in 1990, 44% in 2015). The most dramatic change occurred with China (orange). While China accounted for 15% of all U.S. exports in 2015, prior to 2002 exports to China never exceeded 5% of total. China – a large ag trade partner in recent years– is relatively new to the scene. Figure 4. Share of US Exports to Canada (blue), China (orange), and Mexico (grey), 1990-2015. Data Source: USDA’s FAS: GAT (Global Ag Trade) Database. U.S. ag exports have, and continue to be, important to the U.S agricultural economy. However, it’s important to note that the specific role of exports has changed over time. Bulk export account for a smaller share of total ag exports today while consumer oriented products account for a larger share. 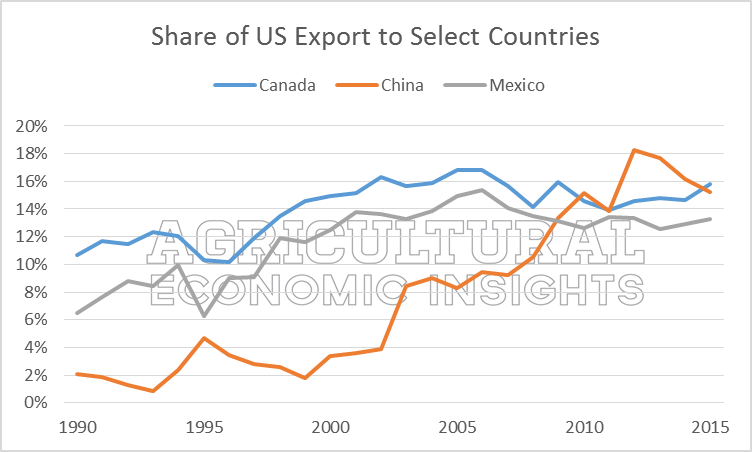 Also, the three nations purchasing the most ag exports today (Canada, China, and Mexico) accounted for less than half of their current market share just 25 years ago. Further to that point, China is a relative newcomer to the game. 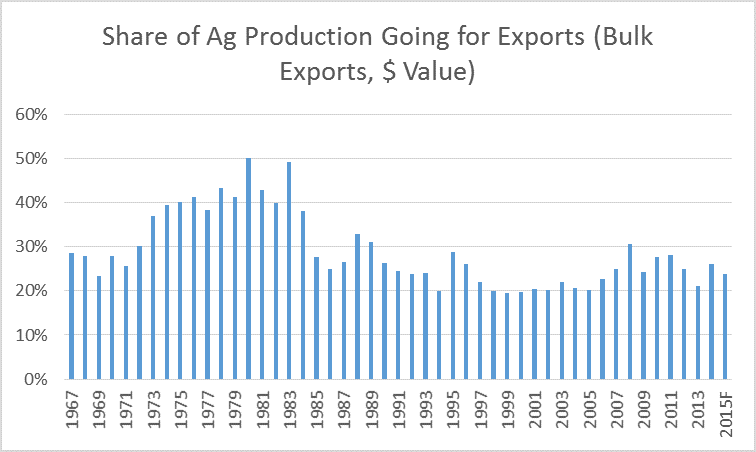 An increase and decrease in the value of ag exports was an important feature of the boom and bust era of the 1970s and 1980s. It’s also important to recognize that an expansion in exports was also a part of the recent boom in the farm economy. Finally, trade has been featured significantly during the 2016 election cycle. While the verdict it still out, the tone and direction of U.S. trade policies will be important to watch and monitor in the coming years. This would be especially critical if relations with one – or more – of the top ag export markets turn sour.